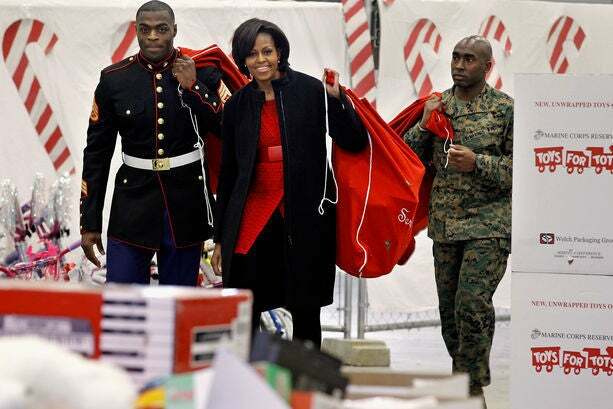 There's no better place for first-class inspiration than the First Lady herself! Check out her selection of fall coats. 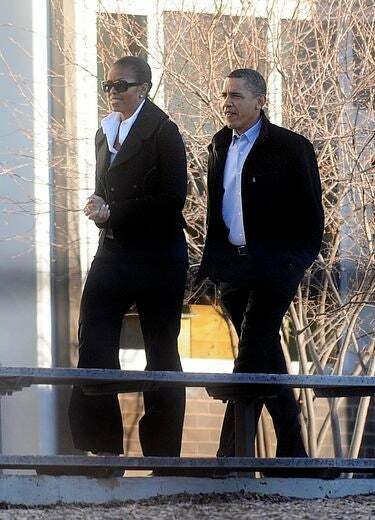 Mrs. O, with her hubby, punches up her classic wide-leg trousers, with a bright, purple knee-length wool coat. What we love most about it? The neckline which extends into a scarf. Mrs. O coat is as beautiful as they come! This beautiful, black number has unexpected elements like a double lapel and rounded shoulders which make it a bold statement count. Michelle Obama balances out a boldly printed scoop neck dress with a classic, tan trench coat. We love the classic colar and double-breasted detail. 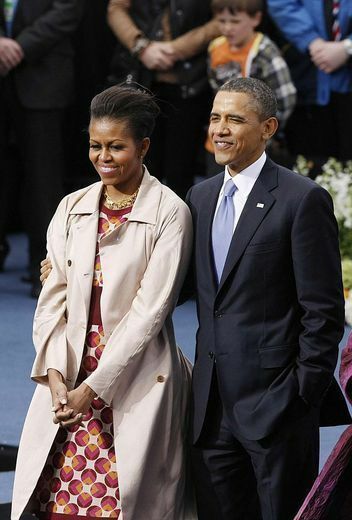 The First Lady pairs her lovely hombre purple sheath with a matching knee-length coat. Mrs. O, with her husband – the President, cut’s a sophisticated figure in this waist length, double breasted, black wool pea-coat. Chic! 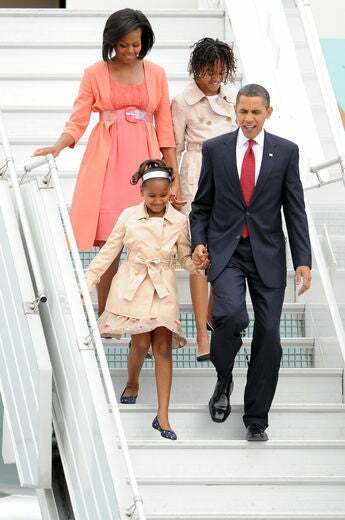 Mrs. O takes a walk on the bold side by pairing her pretty purple dress with a bright, blue knee length cardigan coat. The overall effect of this color-blocked ensemble is uber chic and right on trend! This camel colored coat with ivory piping is by far one of our favorite coat’s by Mrs. O! We love how she wears it with a leopard print scarf! This pic provides us with a clearer view of this camel colored stunner! 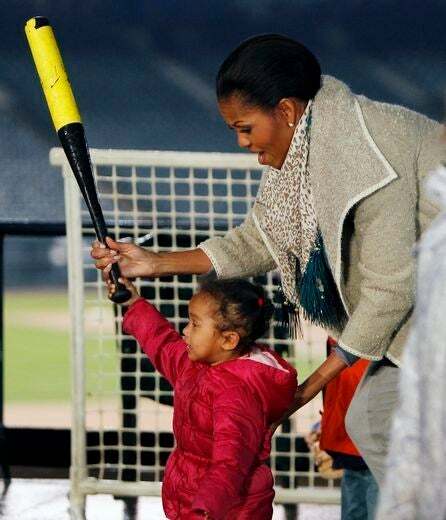 We love how easily Mrs. O can dress down – or dress up – this cute! 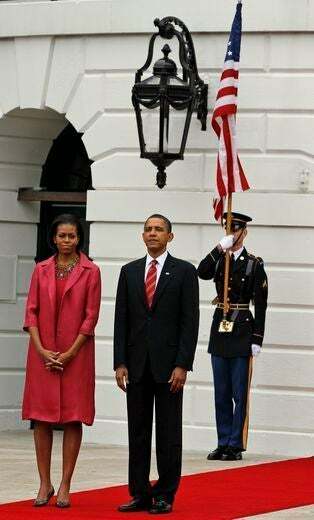 Even a solemn moment can’t distract from Mrs. O’s shining sartorial choices. This lovely pea coat stands out for it’s strong shoulders, traditional collar and edgy cut-out detail on the waistline. A pair of black leather gloves absolutely finish this look off. 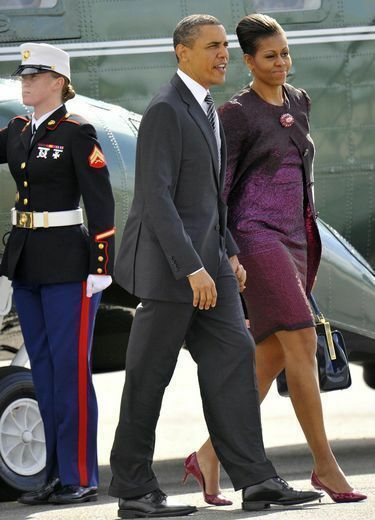 Mrs. O pairs her chic LBD with a brocade style knee length coat. It looks so lovely with her signature pearls and pointy toe pumps. The rich, ruby hue of this silk blend knee length coat, transforms this coat into a stunning show stopper. 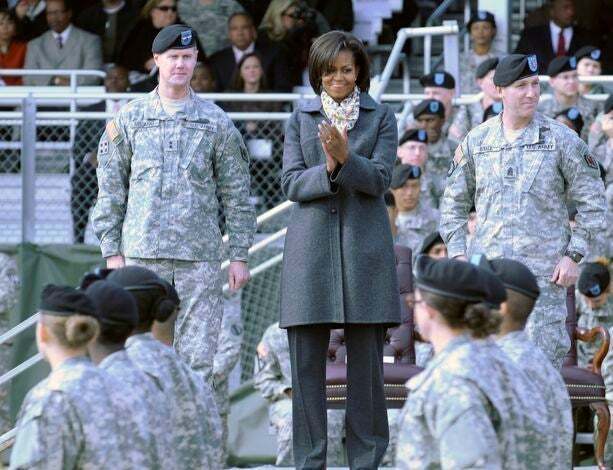 Mrs. O, flanked by two dashing soldiers, is the picture of elegance in this chic, classic wool coat worn with a contrast scarf. It’s not all wool coats and silk blends! 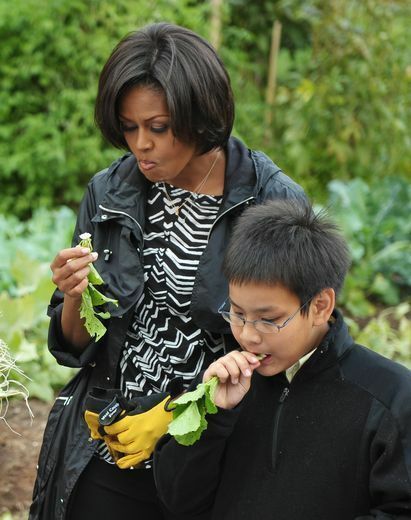 Mrs. O shows that parka’s are just as preferred as she slips into a pretty black parka while gardening with students. 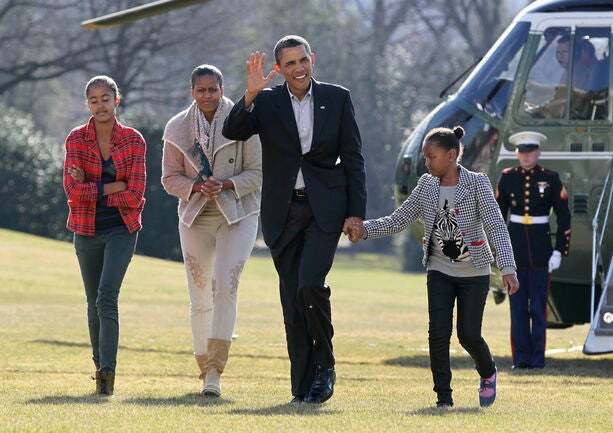 Mrs. O selects a knee-length blue and ivory marbled coat, which she pairs over a similarly colored blue dress. Mrs. O elevates a light fall coat by making it part of a monochrome ensemble! The clear corset style belt ties together the sorbet dress and sorbet coat in more ways than one! Mrs. O elevates a basic black coat by pairing a bold, red cardigan underneath. We love the relaxed elegance of this knee length number. Mrs. O keeps things chic and sleek with this lovely pea-green wool coat that boasts an oversized shawl collar.